I haven’t been able to blog as much as usual, because I am going through some big transitions in my life at the moment, but I just had to cook up these Korean BBQ Tacos and share it with you guys, because they’re amaaaa-zing. I was watching Food Network’s Diners Drive-ins and Dives a week ago, and Guy was touring food trucks, and eating some incredible food. 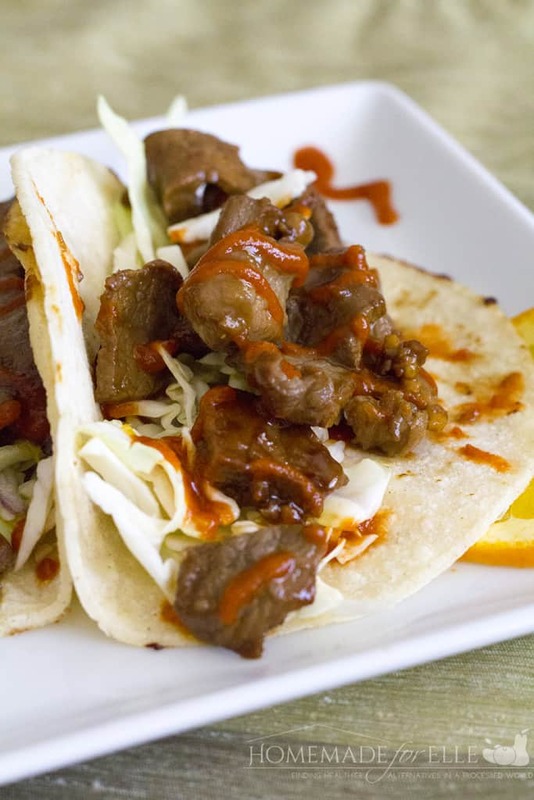 There was one food truck that was serving Korean BBQ Tacos, which were made with corn tortillas, piled up with shredded cabbage, a citrus oil, and then topped with steaming Korean bbq steak and a dash of sriracha. As soon as I saw it, I wanted to eat it! I have sort of been obsessing about those tacos for the last week, and I finally got the chance to make them this morning. So, here is my take on Korean BBQ Tacos. They taste as good as I imagined! The warm corn tortillas are still soft enough to make it really warm and inviting. Instead of using a citrus oil, I mixed shredded cabbage with some fresh orange juice to give it a bright crunch, and the warm Korean BBQ steak is a wonderful balance of salty and sweet. And sriracha makes everything better. 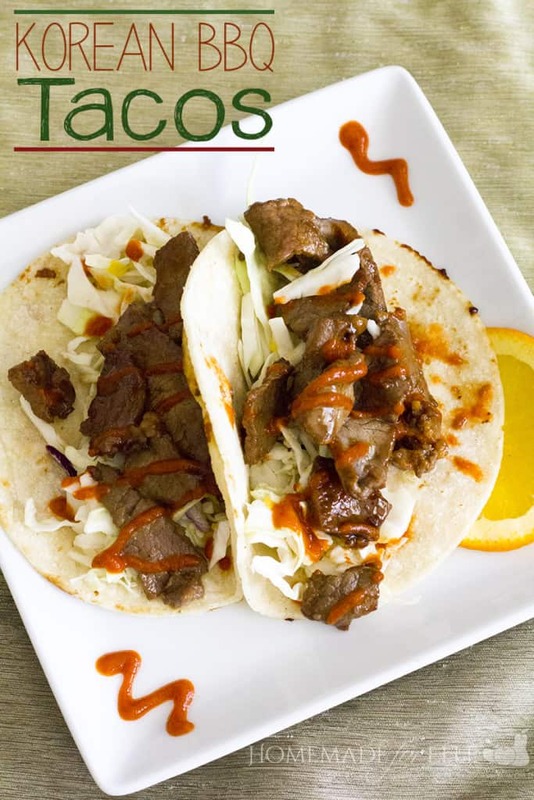 There is so much goodness going on with these Korean BBQ Tacos, that each bite explores a different flavor. They’re truly something special, and so easy to make. I hope you enjoy! I hope you enjoy these delicious Korean barbecue tacos as much as I did! Slice the sirloin steak into thin strips. In a small bowl, combine soy sauce, ginger, brown sugar, garlic and sesame oil. Add in the sirloin steak, give it a good stir, cover and refrigerate for one hour. Meanwhile, mix together shredded cabbage with the juice from the orange. Set aside. Once steak is marinated, heat 2 tablespoons of olive oil in a pan over medium-high heat. Let the oil get warm, then add the steak. Allow it to sit, undisturbed for a couple minutes to get a good caramelization on the steak. Turn, and cook another minute or two, until desired doneness. Set aside and keep warm. Use the same pan you cooked the steak in to warm up the corn tortillas. Just 20 – 30 seconds on each side should do. You’re warming it and making it pliable, but not crunchy. 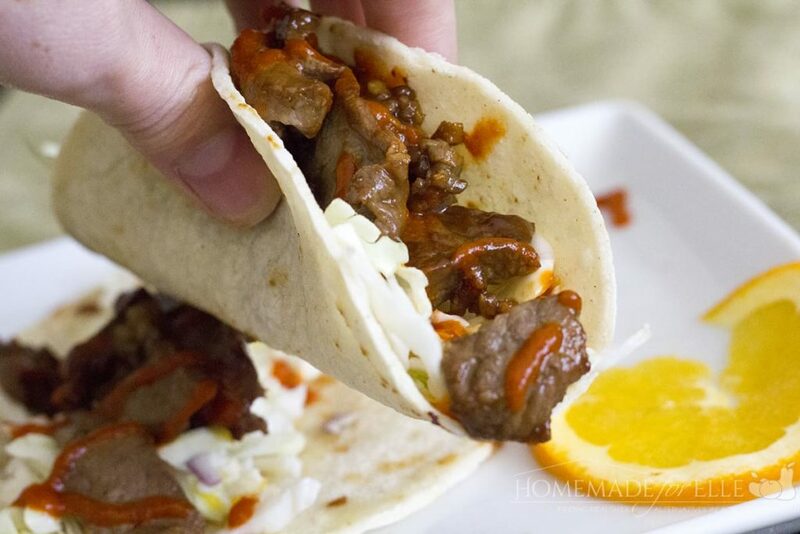 Pile the shredded cabbage on the tortillas, followed by the Korean BBQ steak, and top with a drizzle of sriracha. Welcome to Yum Goggle! We are now following you on all social media platforms and hope you will follow us back. We will try our best to tag you as we promote your posts. Kelli at YG. These look delicious. And I love corn tortillas! I have not made many Korean recipes so this would be fun to try. These are going on my menu this week. They look delicious! What an interesting combination that looks delicious! Korean barbecue was one of my favourite foods while I was in Japan! I think we may be trying this soon. I LOVE Korean barbecue! We have a food truck that serves it near me as well as several great Korean barbecue restaurants. I’ve only ever made it at home once (why?!) but definitely need to more often. Thanks for the new recipe to try! Yum. These look great and I have never even thought of a Korean BBQ taco before! Mmm, mmm! I haven’t tried Korean flavors, but my daughter and I both love trying new things and tacos are one of our favorite foods to get creative with. We will definitely be trying these! Two of my faves, together in one bite??? COunt me in! I’m totally showing this to my husband (so he can make it for me)! Haha! Thanks! These are two of my favorite things! I love how you put them together. Can’t wait to try this recipe. Pinned it! 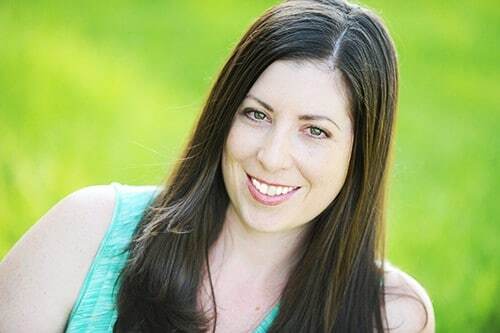 Thanks Kirsten! I hope you like them!